Definition of a Bear Market: A bear market is defined by the trend. 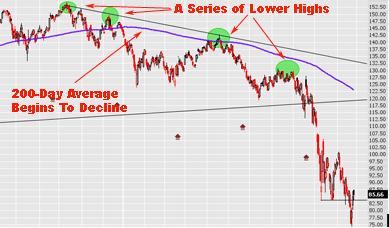 When the market begins to make a series of lower highs and lower lows the trend is considered down. Every time the market bumps up a few points the bottom callers come out in droves. So far they have been right exactly 0% of the time. But how does one recognize when a bottom is truly in place? Even Warren Buffet missed it big time when he bought GS and GE at prices 50% higher than they are right now. For a long term investor I would strongly suggest exiting positions when both of the following occur - and this goes for 401k plans and IRAs (just move to a money market or something stable inside your plan during these times to avoid taxes - or go short if that's to your liking and your risk tolerance). First, when the 200-day average flattens out and then starts to trend lower. And second, wait for confirmation in the form of a lower high. As you can see in the 2-year SPY chart I've posted, a lower high occurred last December. A second lower high occurred in May after the 200-day average was already trending lower. If you were unsure on the first lower high in December you had a second chance to get out in May. Following this simple strategy will keep you out of almost every single bear market - probably all bear markets. As for buying back in, I think it's early still. There is still forced selling amongst the hedge funds taking place. We have had something of a capitulation over the past few weeks that may or may not lead to a rally. If it does I'm betting that rally still compliments the series of lower highs that have been taking place since December. I think that the SPY needs to come back to $70 before a more serious rally takes place. Even then, that is not a reason to buy long term. For long term there is no need to try and catch the exact bottom. Wait for the 200-day average to flatten out again and start to turn up. Then make sure it confirms by putting in a higher low. The high for the SPY was 154. The second higher low was 140, less than 10% from the top. If you miss the first 10% from the bottom, big deal. Heck, if you miss the first 20% from the bottom, big deal. The next bull market is likely to climb 100-200%, who cares if you miss the first little bump? The risk management advantages of this strategy are worth far more than 20%. The alternative is to buy when you think a low is in place and then end up losing another 50%. Regaining that 50% requires a 100% move. Hopefully this makes sense and that it helps everyone.